My uncle (Steve Massie) passed away about a week ago. His celebration of life was on Wednesday. He was 66 years old. He faught the good fight against cancer, cancer that had started in his bladder and ultimately spread to his leg, muscle and bone. In the beginning, the chemo shrunk the tumor but unfortunatly it stopped working and the tumor began to grow and cause a lot of pain. I learned so much about him at his ceremony. He chose to have a celebration of life, rather than a “funeral”, at a beautiful nature center close to his home. His two children and wife spoke and shared so many wonderful stories. It was very emotional, but in a happy way. 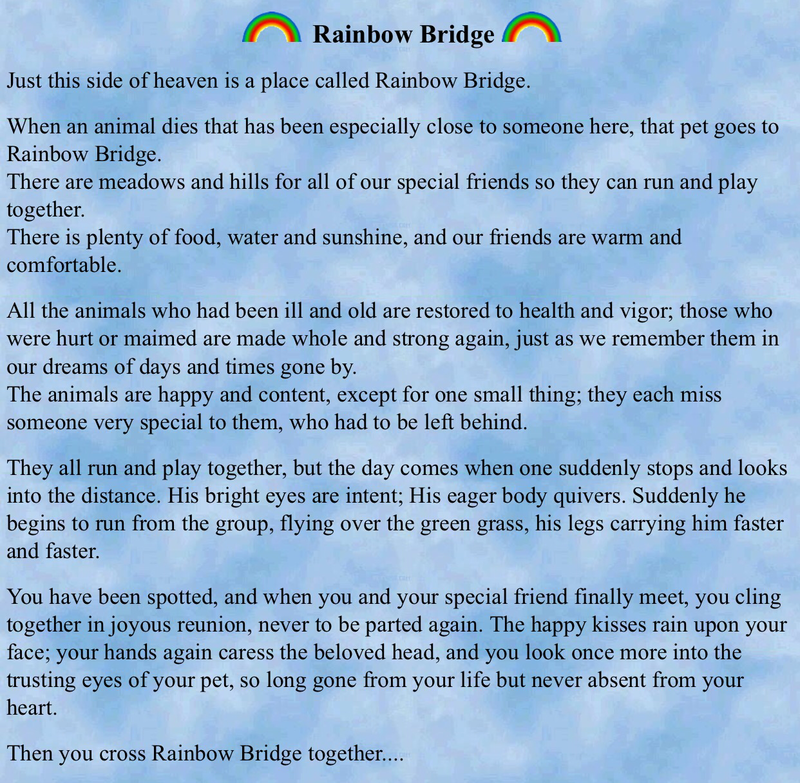 Steve was an animal lover, he requested the poem “The Rainbow Bridge” to be read, this poem is about meeting your pets in heaven. It was so touching for me because I too am an big time animal lover and I did not know that about him. I now know that I definitely inherit that from the Massie side of me. I find it funny that I went to the zoo wednesday afternoon right before his ceremony. I haven’t been to the zoo in years and I had no intention on going. I had been thinking of his passing and wanted to clear my mind and I find it so funny that that is how I chose to do it. The ceremony was wonderful. My cousins, Heather and Traivs shared their hearts and he shined right through them. Steve and his wife Jane have known each other since they were 16 years old. She shared that from the minute she met him she knew he was her soul mate. It was one of the most beautiful things I have heard because it was so incredibly genuine and straight from her heart. 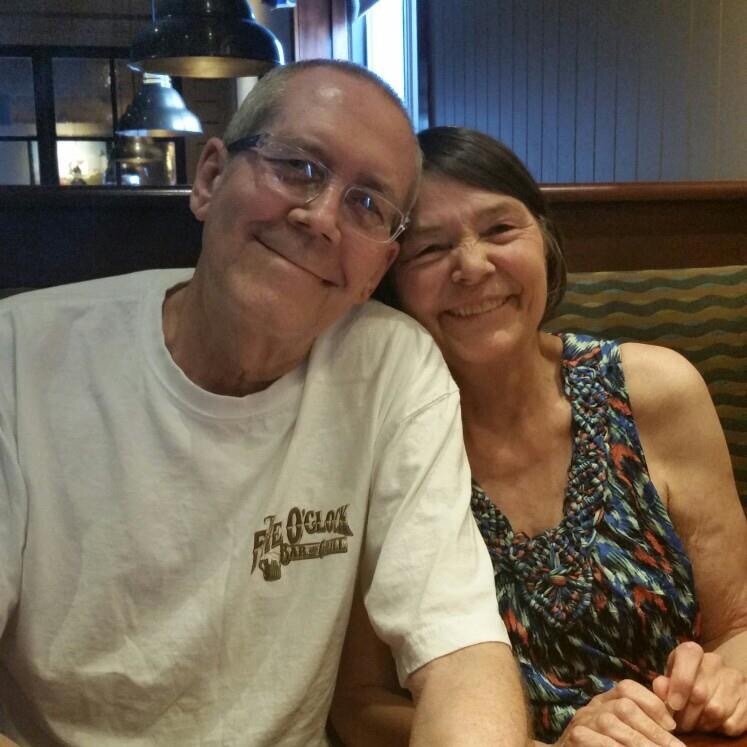 It breaks my heart that cancer has taken him from her and it angers me that with all the technology we have today, we can’t figure out how to cure cancer. It’s not right. It’s very hard to have your health taken away from you but I can’t imagine the feeling of having your life taken from you, because of cancer. All of us who have had cancer have a special connection to each other, and it is incredibly difficult to watch someone fight and fight and run out of options. It feels personal. It feels defeating. It feels so unfair. Also last week, a young woman I know from one of my cancer groups passed away from the same cancer I had (Primary Mediastinal Large B Cell Lymphoma) and her final post on Facebook was just gut wrenching, what do you say to that? To a woman making her final post that the lymphoma has won. Then her husband made one last post that she will no longer be with us, before shutting her account down. It’s that fast. That quick. After watching her go through this for so long. Expecting the same outcome as me. Offering suggestions. Offering hope. Praying. Cancer has a mind of its own. I just have to keep telling myself that God has a plan for us all. It’s hard. It’s been a tough couple of weeks. One thing that made me very happy this week was when my cousin Heather said to me that her dad (Steve) followed my blog when he was going through his treatments; she thanked me and said it helped him and gave him some hope. Even though I am through with treatments, I have to remember that there are so many out there just starting, just being diagnosed, like myself not long ago, and they are doing exactly what every newly diagnosed person on earth does…ask google! I spent COUNTLESS hours reading blogs and looking for hope and for answers. That is why I started this blog. I still get views every day from all around the world. My journey doesn’t end when my treatments end, there are many questions to be answered. Life after cancer is just as scary, and there are people out there looking for someone to relate to, that is what keeps me going. Please follow my blog also by entering your email address! Walter Steve Massie was a GREAT man even though we never met his inner peace speaks through your posting. How emotionally touching and truly BEAUTIFUL! Thank You for sharing I never knew there was a PEOM. Now I have it to share with the EVERYONE! Thank You! This is now what I want when I have to cross over to HEAVEN.